For this years Flag Day, I chose to help celebrate the Star Spangled Banner’s 200 years! As national treasures go, it was a bargain: $405.90 was paid to Mary Pickersgill of Baltimore, who fashioned it from red, blue and undyed wool, plus cotton for the 15 stars to fly at the fortress guarding the city’s harbor. 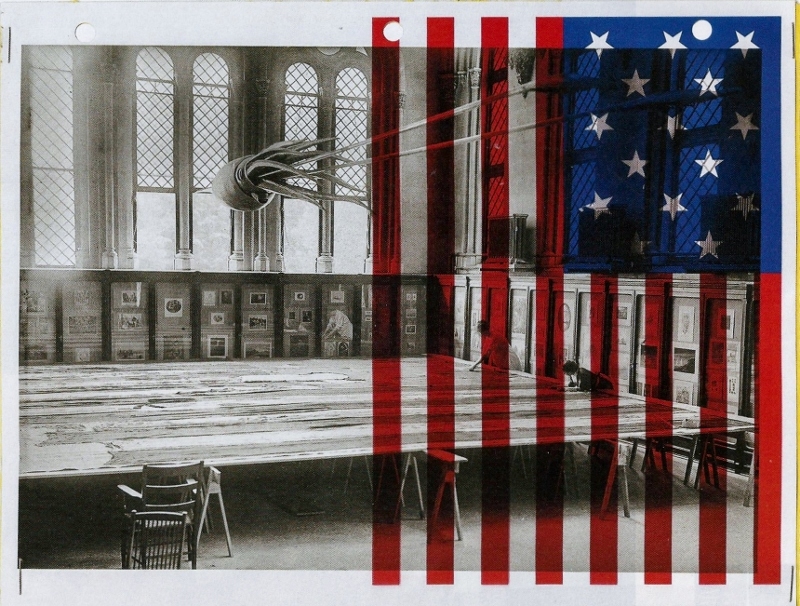 A collage of 2 women, 1914, at the Smithsonian working to restore the Star-Spangled Banner in a room with a model of a giant squid; by Terry Winters. A Betsy Ross Flag Day. 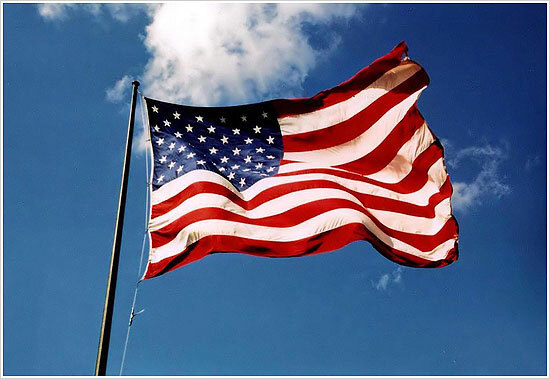 The flag itself, enshrined since 2008 in a special chamber at the Smithsonian’s National Museum of American History, following a $7 million restoration and due to be celebrated today, 14 June 2014 with a national singalong (http://anthemforamerica.si.edu/) remains a bold statement. But what is it saying to you? This story was taken from the Smithsonian Magazine with many thanks. Brandon Maggart – Kirksville, MO; US Army, Iraq, Sgt., 5th Air Defense Artillery Reg. Posted on June 14, 2014, in Uncategorized. Bookmark the permalink. 77 Comments. Thank you very much for your help. People often forget about Flag Day. This is information that people tend to forget about, so thank you very much for sharing the link with us. This definitely supplements the post!! Great tributes to the various flags that actually do define a Country, and not a Government political statement. Thank you, Ian – I was trying to find those very words when I was answering Pete. Our community is having a Flag Day Celebration. A local actor will tell the story of the flag through taking on the character of Betsy Ross’ third husband! Patriotic songs and poems will be presented. This is a first for Cambridge, Ohio. Great, Bev! I didn’t know the ol’ gal had been married 3 times, but it is an intriguing idea – whoever thought of this should be congratulated. Take pictures!!! I second that motion…let em’ fly!! Terrific, Steven, and thank you! I have been fortunate to have seen this at the Smithsonian since the restoration. I have to admit it was pretty awesome seeing something so intimate about our personal history. It was like finding an ancient artifact. I think I would have enjoyed watching the restoration as mentioned above. Glad to know your computer is okay – I just left a message for you on your site!! I keep meaning to get back to Washington, one day….. I envy you having seen the flag in parson. Got your message and deleted it. 😀 Be in touch soon. Thank you so much, Ileana for stopping in to see us today!! Thanks very much for this interesting story. A PROUD DAY IN JUNE – FLY THOSE FLAGS!! 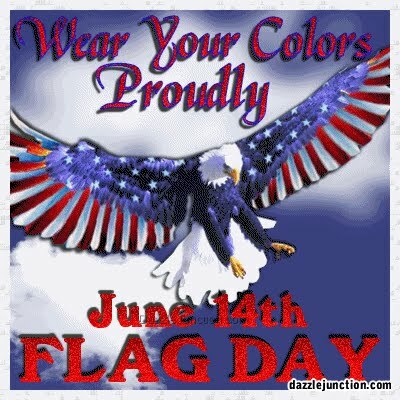 I can’t believe that I missed flag day! I feel ashamed for having missed it. This reminds me that I need to visit your blog more often!!! Hahaha! Yes I will not forget the Fourth!!! Interesting some things I never knew! I’m glad to have had the information here then, Elizabeth. And thank you for reading. An interesting post my friend, one thing I have noticed over the years is that Americans are very patriotic with their flag, flown on most houses and public buildings. I am currently trying to ascertain the regulations in Australia for flying our flag on an aerial on my car, seems its a grey area. Your Old Glory has appeared in many places around the world over many decades. Some people fly the flag every day, but unfortunately, for most it goes in spurts – according to current events. Even commemorative holidays will often go by unnoticed – unless the public receives a day off work for it – like July 4th. For awhile there it seemed every house was dressed for the red/white & blue and then it gradually faded away – like MacArthur. I thank you for reading and DO check on the regs for your Australian flag – it’s only right that it should be flown, Ian – you DID fight for it! Wow. I’d like to hear that British drinking song. I’m sure there must be a British site that has it. Isn’t it Fantastic! Thank you for adding that. Wonderful picture, GP. I’m going out in a few minutes to take my flag down for the night. I knew I wouldn’t have to ask you if your flag was out on a commemorative holiday!! Way to go and thanks for the compliment! A beautiful post, Gail! Our flag flew today until that big thunderstorm rolled in! I can’t remember if our flag is an all-weather flag or not. Hasn’t the wind been awful in the PM?! Happy you are considerate of the flag’s condition – that means a lot. I appreciate you taking the time to stop in, Linda! Why, thank you very much, Elaine. I’m so proud to have such patriotic readers I can call friends. Great post and agree with inesphoto that :”If you don’t respect your country, you don’t respect yourself.” Sadly I feel that is lacking today. I suppose it is not COOL to be patriotic today – for that I blame the parents, for who else are the kids to learn from? Certainly not the schools where the teachers have to monitor every word they say. I thank you for the compliment and can easily see by your site just how patriotic you are – great! I do think that it is COOL and yes very patriotic here. It has to be difficult to be a teacher now and do think that there has to be some parents out there that instilling that in their children. I certainly hope so. It is mandatory for our survival, don’t you think? The Bicentennial of the War of 1812, bombardment of Fort McHenry and the writing of the “The Star Spangled Banner” will be celebrated this coming September in Baltimore, Maryland this coming September. For many a relatively unknown war, the War of 1812 is frequently cited as America’s “Second War of Independence”. To understand our country, it is worthwhile studying. Very good point. I thought I would combine the two since Anthem for America was having their big celebration yesterday. The two seemed to go together (for me any way). The War of 1812, IMO, is neglected because of how quickly it ended, sort a Grenada of the 1800’s. It shouldn’t negate the importance of the war in any way, but I just think that’s why people don’t usually remember much about it. Ditto, Curt. Hope you and your friends had your flag out, eh? It speaks of countless men and women who for hundreds of years now have worked, toiled, fought, loved and celebrated this country. VERY well said, Colleen. 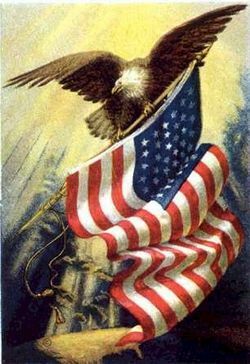 That is how I feel when I see the flag, that it represents every person who fought for these freedoms. Have a proud Flag Day . Among all other things , of course , your blog is reason enough to be proud : a great contribution to national pride . Thank you very much, Dan. That means a lot. I hope many in your neighborhood had set their flags out for display. Nice story for this Flag Day! Thanks, gpcox. The pictures are terrific, wish I had thought it thru enough and added a photo of the fort. Thanks for coming by and adding to our data. The Japanese sketches were also wonderful, I’ve always liked Japanese art and have the one Smitty brought home in a frame. Good to see Mr.Grant, the Nisei codebreaker, and said thank you. 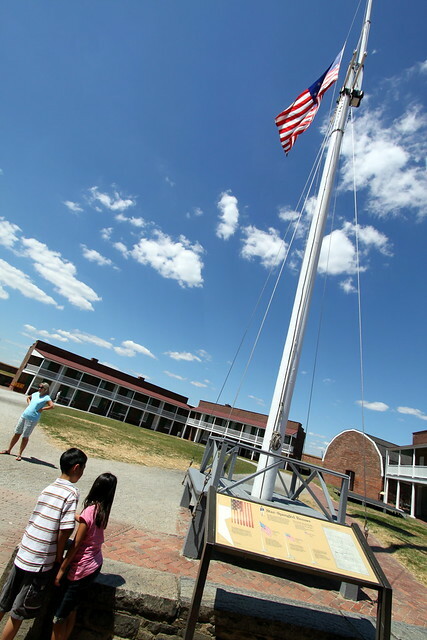 I first saw the Star-spangled Banner at the Smithsonian in 1983 when it was still hung on a wall. Every thirty minutes the drape covering it would be pulled back while they played a recording of the national anthem. The next two times I saw the flag, in 1997 and 2006, it was in the restoring rooms where they were doing the restoration. They had a display and glass windows where you could watch the progress of the work. I hope to get back to DC in a couple of years to see the fully restored flag. Wouldn’t that be great, Andrew!! I would love to see it. I’ve been at the Smithsonian twice, but never got to see the flag, there is so much to see there! Thank you for commenting. I appreciate you helping to keep some patriotism in the nation, Jueseppi. Excellent post!! I need to share …. Honor!! I thank you very much, Lil for reblogging this post and helping this nation to retain it’s patriotism! It needed to be shared!! Thank you once again, Paul for this reblog – continuing to help this nation remember! I love the graphics you use gpcox, they speak loud and clear. Thanks, I try to keep things fresh. I wish people understand that governments come and go but “Country” means “People”. If you don’t respect your country, you don’t respect yourself. Very well said, thank you for that! I think we ALL can!! Thanks for coming by! A lovely tribute to the flag, thanks for sharing the great post, GPCox! Great to see all 4 of you here today, especially since this is not a holiday celebrated in Europe. I appreciate your consideration!